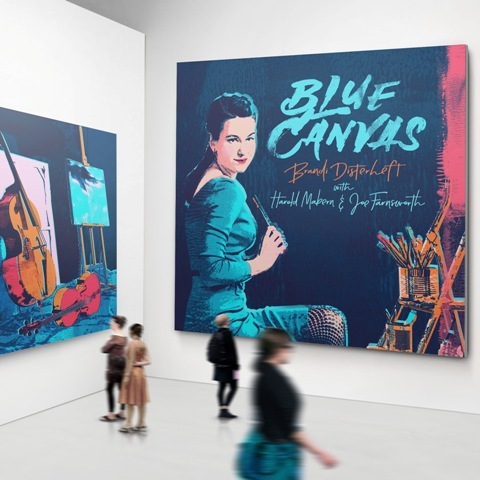 Juno Award winning bassist, composer, and vocalist, Brandi Disterheft unveils her fourth recording Blue Canvas, her third release with Montreal’s Justin Time Records. Like a savvy card player, she pulls out two aces from her deck in this new offering, joining forces with hard bop veteran pianist Harold Mabern and drummer Joe Farnsworth. The album was recorded in the summer of 2015 in Montreal after a successful club engagement at the Festival International de Jazz de Montréal. On Blue Canvas Disterheft confidently backs Mabern, who at 80-years young is still tickling the ivories with soulful panache. Ever the gentlemen, he returns the favour thanks to his sensitive accompaniment to Brandi’s own solos, one of them a cappella “Prelude to Crippling Thrill”. On the following cut “Crippling Thrill”, and two other originals – the album's title track and “When the Mood is Right” – Brandi’s playing, as well as her singing of the self-penned lyrics, suggest a haunting yet unsentimental beauty. What's more, she marks her debut on cello in the latter piece, tipping her cap to the legendary Oscar Pettiford. Disterheft, who is a prolific composer, claims she specifically wrote the originals of the album with the trio in mind. Between her original pieces and jazz classics like Bobby Timmons' “Dis Here”, Tadd Dameron's “Our Delight”, and rarely heard Clifford Brown’s “George's Dilemma”, the music paints itself over a canvas of luminous colours. The band smartly varies the moods and tempos, sparked throughout by Farnsworth’s nimble grooves. Additional album highlights include an unusual rhapsodic treatment of Clifford Brown’s “Daahoud”, a decidedly fresh take on the standard “Willow Weep for Me”, and a fine romp over Mabern's own “Beehive”. Brandi Disterheft has toured throughout North America and abroad. She has studied with Don Thompson, Niels-Henning Ørsted Pedersen, Rufus Reid and Ron Carter. A native of North Vancouver Brandi is now based in New York.